Newbies of all bays, listen up! Here, you’ll find the must have surf gear you need before beginning this great adventure. Ok, we won’t lie: you’ll probably still look like a grommet, but at least you won’t make unforgivable mistakes! You have been sitting on your beach towel all your life long, admiring the surfers’ pirouettes. All your life long, till now. Now, you have decided that it is time to take courage and start paddling out yourself. Because, although it is so fun watching it, you are sure it is way, way better doing it. And, yes, it is: it will be difficult at the beginning, but then you’ll learn that “surfing is attitude dancing” – thank you Gerry Lopez for that. Now, take a big breath and start understanding how to be perfectly kitted out! Board: which one is better for beginners? Your first board is like your first love: you’ll never forget about it. It will be your better half during these first, essential, steps. You will share tears, laughs and fears with it. And, when you’ll be able to stand up, you’ll understand all its greatness and how incredibly tied you two are. Follow the rule “the bigger, the better”: it will be easier to stand up and not fall down – at least not too many times. A good beginner board needs a high buoyancy as well, so that errors can be better tolerated. Moreover, newbies’ boards should be super soft: this will help you to catch as many waves as possible. Width: between 20 to 22 inches. Thickness: between 2-1/4 to 3. These, however, are very general rules and change according to your body shape. The best thing you could do is to go to your local shop and ask for some help! There is only one answer: it depends on the climate of your surfing spot. If it’s warm enough, you’ll be able to wear nothing but your board-shorts. Lucky you: you can choose your clothes according to your taste! Be careful, tough, not to pick the brightest colors and the most original patterns: you don’t want to be too quirky at the very beginning of your surfing career! 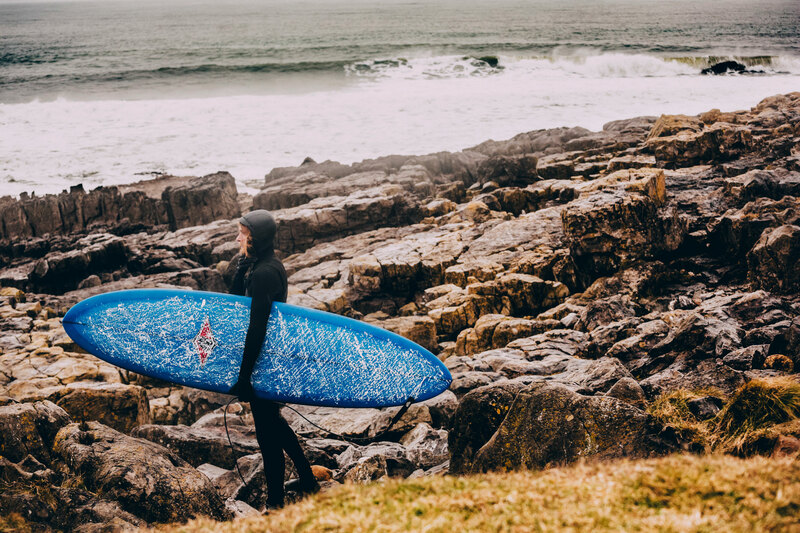 On the other hand, if you are about to surf in cold waters, you should go for a less fashionable, more functional wetsuit. Go to your local shop and have a look at the different kinds. Try them on to see which one suits you better and be careful not to put it on backwards. Yes, we are not joking: more than one grommet has been teased all his life long. A tip: look for the zip, which is usually on the back! It is extremely important to understand the differences between one wax and the other. It’s not a question of brand: every surfer has its favorite. Rather, you have to get the right wax for the temperature of the water you are about to paddle into. Usually, there are cold, cool, warm and tropical waxes: their differences lay in their hardness and every brand makes sure to tag the wax packages with the corresponding degrees. As the water temperature decreases, the wax tends to get harder. So, you’ll need a softer wax, like the cold and cool ones. Don’t mix up these waxes with base coat. Base coat is something you need to buy regardless of the water temperature. Basically, it is a super hard wax used to make a thin coat on a new board. Its application will help you having a more beady board texture. Now, you are all set up to head to a surf shop. Buy these items and you won’t need anything else but a little bit of courage!